This full length yoga nidra for sleep guided meditation will help your body and mind to easily fall into a deep sleep. If you suffer from insomnia, yoga nidra is a wonderful practice to regenerate and re-balance. 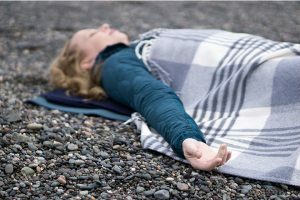 Yoga nidra is a powerful meditation to access deep restorative sleep that will allow your body and mind to come back to life and fully recharge your batteries. Yoga nidra sleep meditation prepares your body chemistry for sleep. Yoga nidra increases the release of melatonin and slows its release in your body allowing you to experience more sleep cycles in the night. 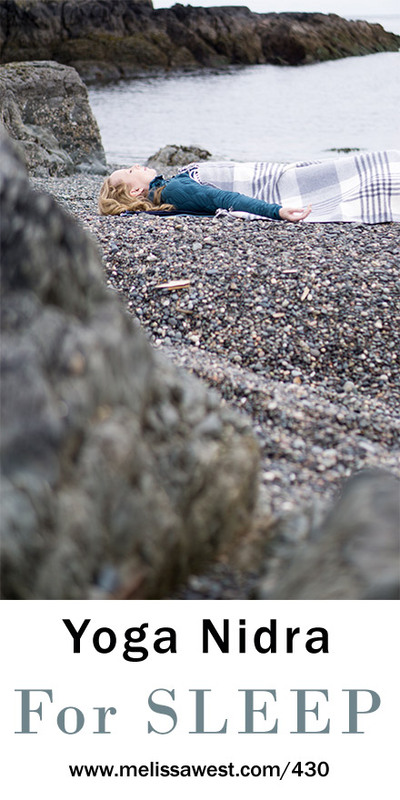 If you experience insomnia or stress and anxiety during sleep time hours, know that yoga nidra for sleep is an effective way to teach your body to enter into a parasympathetic response of rest and digest, let go of the worries of the day and the next day and be able to enter into a deep and restful sleep. The guided verbal instructions will lead you to a state of consciousness that are somewhere between waking, dreaming and sleeping. In order to practice yoga nidra you want to be as comfortable as possible. You can practice it on a yoga mat, but you could also practice it in bed, on the couch or in a chair. You are going to be here for 20 minutes, so it is a good idea to have some padding underneath you and a blanket overtop of you in case you get cool. You might want to have a pillow under your head so that your chin is slightly lower than your forehead. This will allow you to access your parasympathetic nervous system – your rest and digest. Using and eye pillow or covering your eyes will allow your eyes to relax. When you practice yoga nidra there is no way you can do it wrong. Let go of trying to do it right. You don’t need to try to stay awake or to try to have a deep experience. You may even fall asleep and that is not a problem. Should you feel discomfort or resistance to your practice, know that it is not unusual. If physical discomfort or pain persists feel free to adjust your position to become more comfortable. Distractions are often a good way to come back to our practice. Remember, you are always free to step away from your yoga nidra practice at anytime if it becomes overwhelming. If at anytime, the words of the guided meditation do not work for you, let them go, and be with the guidance of your own inner teacher, it always knows best. Our members get exclusive access to our yoga nidra audio download files first. They have had this yoga nidra for the past two weeks. Links to audio downloads yoga nidra for sleep and 10 other yoga nidras are below as well as a link to become a member to get exclusive access to these audio download files. Thanks to Dusky Leaf for my props, today you are going to need: 2 blankets,bolster, eye pillow.